Natural chocolate flavors, cocoa (processed with alkali), sunflower lecithin, xanthan gum, rebaudioside A (stevia leaf extract). Contains: milk. Directions For Use: Adults, mix one (1) scoop (25.7g) (0.91oz) with one (1) cup (8 fl. oz.) (237mL) of cold water or your favorite beverage to supplement your diet with protein. Stir briskly until dissolved. If you are pregnant or nursing, taking medication or planning a surgery, consult your doctor before using this product. If any adverse reactions offur, stop taking the product and consult your doctor. Protein blend (whey protein concentrate, milk protein concentrate (micellar casein), ultra-filtered/micro-filtered (UF/MF) whey protein isolate), organic cane juice syrup, natural flavors, sunflower oil creamer (sunflower oil, glucose syrup solids, sodium caseinate, mono & diglycerides, dipotassium phosphate, tricalcium phosphate, soy lecithin, tocopherols), stabilizer blend (cellulose gum, xanthan gum, carrageenan), lecithin and salt. Contains milk and soy. Phenylalanine and Tryptophan are not added to this product; they are naturally occurring in the whey. 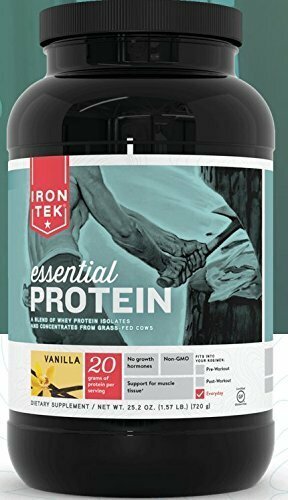 Iron-Tek® Essential Natural High Protein is designed to be taken two (2) to three (3) times daily. Iron-Tek® Essential Natural Protein is especially beneficial when taken immediately after a workout. Iron-Tek® Essential Natural Protein can be taken by adults to supplement dietary protein as needed. Using scoop provided, add one (1) scoop (35.5 g)(1.25 oz.) to one (1) cup (6-8 fl. oz.) (178-237 mL) or more of either cold water or your favorite cold beverage. Stir briskly until dissolved for a tasty vanilla protein supplement. For a creamier texture, use a blender and add ice. You may also try adding your favorite fruit. As a reminder, discuss the supplements and medication that you take with your health care providers. -Increases glutathione production in the body. Protein blend (whey protein concentrate, milk protein concentrate (micellar casein), ultra-filtered/micro-filtered (UF/MF) whey protein isolate), organic cane juice syrup, cocoa powder, natural flavors, Sunflower oil creamer (sunflower oil, glucose syrup solids, sodium caseinate, mono and diglycerides, dipotassium phosphate, tricalcium phosphate, soy lecithin, tocopherols)stablizer blend (cellulose gum, xanthan gum, carrageenan), lecithin, salt. Contains Milk and Soy. Adults, using scoop provided, add one (1) scoop (37.5g) (1.25oz) to one (1) cup (6-8 fl. oz. )(178-237mL) or more of either cold water or your favorite cold beverage. Stir briskly until dissolved for a tasty vanilla protein supplement. For a creamier texture, use a blender and add ice. You may also try adding your favorite fruit.